After you make some edits on your photos and update them, you can see the new edited photos on all your devices as long as they’re connected to the cloud. However, the photos are secure, and only you can view them unless you decide to share them. Select a photo in your library. Tap the Action icon on your device. Tap Share or Share to Facebook, as shown. 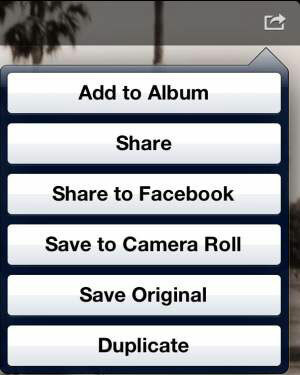 If you want to share your photo via Facebook, tap the Share to Facebook option. If you want to share via Twitter, Flickr, or e-mail, tap Share. Tap an option for where you want to send the file. In our example, it is shared to Facebook. In the window that opens, you can type a title for your photo and identify a location, as shown in the figure. Add a title and location. Tap the Post button to upload the photo to your Facebook account. To share a photo from your desktop Mac, click the Action icon to choose a share option. However, the choices available to you are very different from those available on iOS, as shown in this figure. You have options to share the selected album or photo to Facebook, Twitter, Flickr, e-mailing the photo, Message (SMS), or AirDrop (a local WiFi ad hoc Apple service for sharing across all Apple devices). Choose the sharing option you want and follow the instructions provided in menus to post your photo.